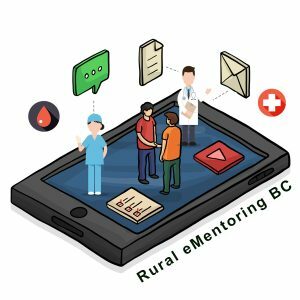 Rural eMentoring is online mentoring program that connects rural high school students to mentors who are studying Health Sciences all over the province. Our aim is to support high school graduation, promote rural, remote, and Indigenous health science potential, and inspire a future generation of rural health practitioners. We exist to give rural youth mentors who have practical post-secondary advice to share. Our curriculum is aimed at stimulating youth to consider their education and career options, share their high school experience, and ask any related questions to a mentor invested in their future. ReMBC is the latest evolution of Aboriginal eMentoring. 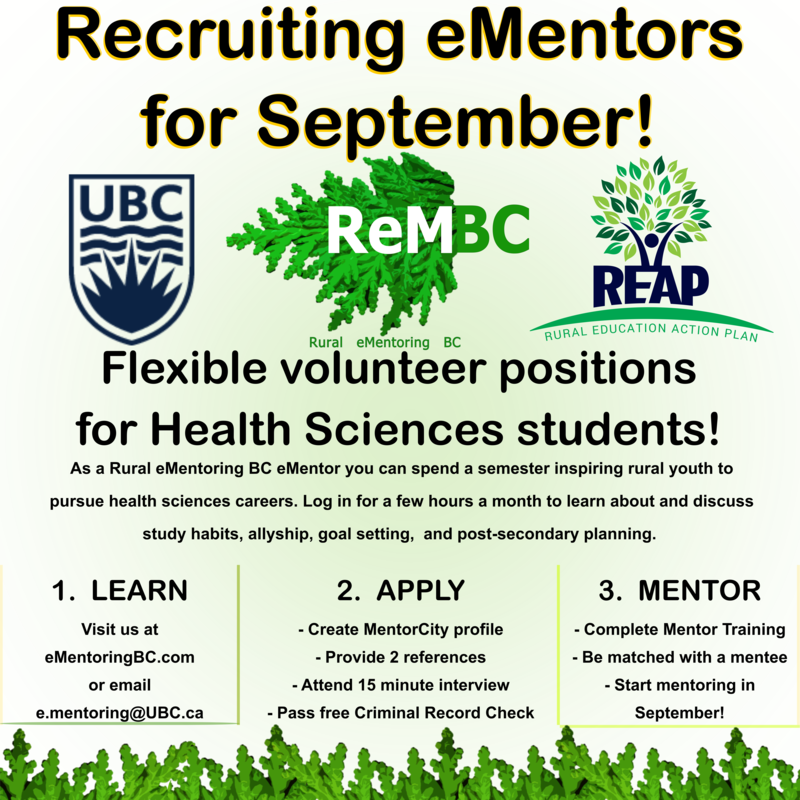 As AeMBC we served rural and urban Indigenous youth for 8 years, connecting them with Health Science mentors using a curriculum rooted in Indigenous ways of relating. In order to honour our historic partners we have embedded Aboriginal eMentoring as a stream of Rural eMentoring. We continue to connect rural Indigenous youth who self-identify with Indigenous mentors studying health sciences. 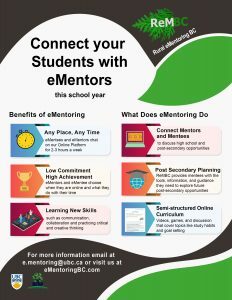 eMentees and eMentors exchange messages on our MentorCity platform to discuss videos, readings, exercises, and games that get students learning and thinking about their future and post-secondary opportunities. Over the course of one academic semester, eMentors and eMentees engage with a semi-structured online curriculum called “Personal Quest”. The Quest guides their conversation through reflecting on their high school experiences, considering career goals, and preparing for their next steps in education. Conversations are driven by student curiosity, eMentors fill the gaps as eMentees imagine and reflect on their potential. eMentors share how they chose health sciences, how they prepared for post-secondary, and the day-to-day of pursuing their goals. All communication between eMentors and eMentees takes place on our platform. eMentees are youth in grades 8–12 living and studying in rural communities all over BC. 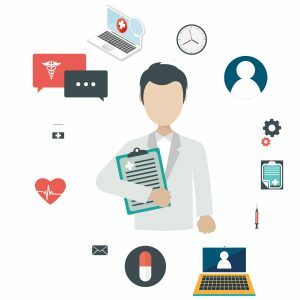 Youth join the program as a part of a class, as an extracurricular, or because they’re already interested in Health Sciences. 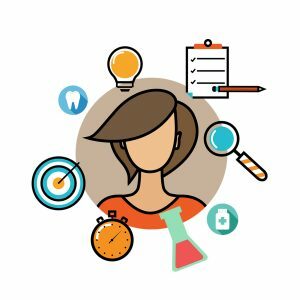 We pair eMentees and eMentors according to their desire to pursue careers in rural communities, their fields of interest, and the passions they share on their MentorCity profile. eMentors are postsecondary Health Sciences students, from diverse cultural backgrounds. They join the program from all parts of the province. They commit a few hours every week to discussing topics like study habits, allyship, goal setting, and post-secondary planning with eMentees. Although all our eMentors are on health sciences journeys, their first priority is supporting rural students where they’re at. eMentors are trained to hold space for students and support them in exploring wherever their career curiosity takes them. Via our stream-specific training eMentors learn that rural, remote, and Indigenous communities are each unique, how to be sensitive to eMentee needs, and thoughtful when engaging. Our aim is to support high school graduation, promote rural, remote, and Indigenous health science potential, and inspire a future generation of rural health practitioners. eMentoring relationships are low commitment, high fulfillment. Our focus is building self-efficacy in students. They decide which sections of the curriculum they want to spend time on and their curiosity is what drives conversations. Student choose to focus on what is relevant for them and learn about what will impact their future. eMentoring relationships last between a school semester to school year. Students participate as a part of their Career and Education classes, as a school offered extracurricular, and as keen individuals who connect outside of school time. The Rural eMentoring BC team is the point of contact between eMentors, teachers, and the broader school communities. We coordinate all aspects of the program and accommodate and provide the best experience for eMentees, eMentors, their educators, families, and communities. 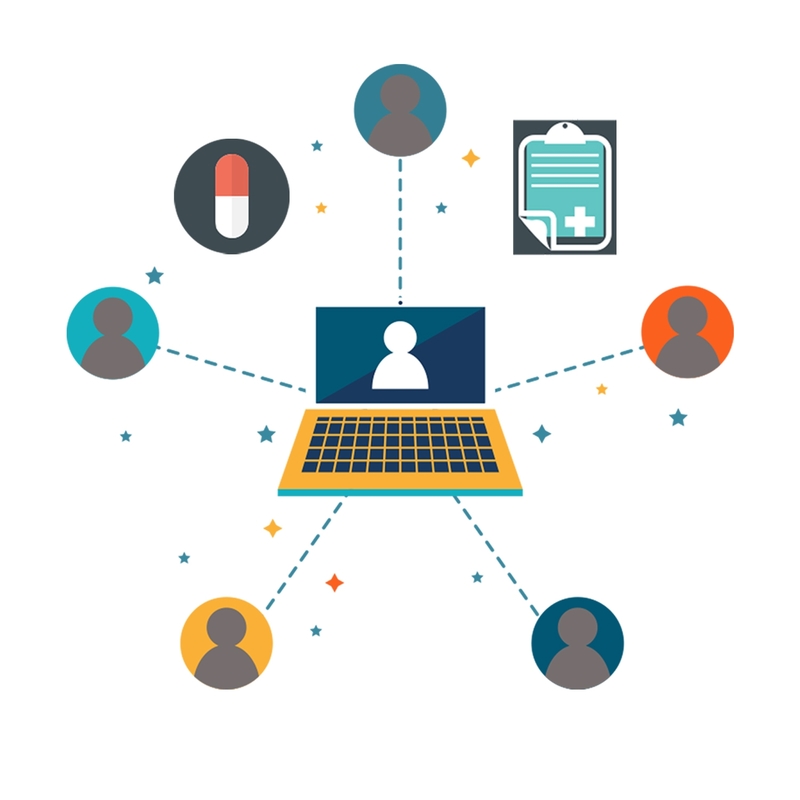 We are here to help communities bring eMentoring home and here to help navigate the platform and curriculum once connected. Rural eMentoring BC is a Rural Education Action plan initiative. ReMBC is coordinated from the Faculty of Pharmaceutical Sciences at the University of British Columbia. ReMBC is the latest evolution of Aboriginal eMentoring BC, originally funded by the Canadian Institutes of Health Research (2010-14) and is now funded by the BC Ministry of Health via the Joint Standing Committee on Rural issues. Interested in making your school an eMentoring school? Now we are looking for 3 rural schools to become eMentoring schools in the 2018/2019 school year. Join high schools around the province that are providing their students with mentors for a semester or the whole school year. eMentoring schools receive an up to $1000 in funds to implement eMentoring. These funds can go towards pizza parties, buying technology, bringing speakers to the community, etc. As a part of the REAP and UBC family, we’re connected with Medical professionals and students all around the province who can speak to your youth! 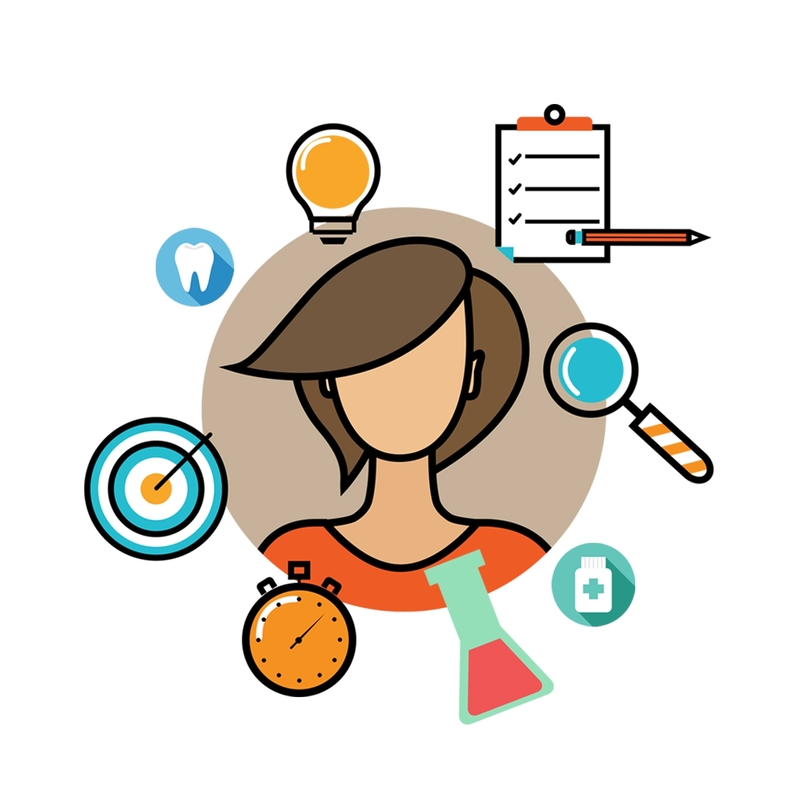 Let us work with you to get your students geared up for eMentoring! Email us at mentoring@ubc.ca to let us know you’re interested. We’ll send you a welcome package. Create your account with MentorCity: www.mentorcity.com/rembc. Matching takes place at the beginning of either high school semester. Training will be sent two weeks prior to matching. For more information about the program, please see the eMentor welcome package here.